The road between Eshowe and Vryheid reaches its highest point just beyond Melmoth, where there is a turn-off that drops down to the modern Zululand capital of Ulundi. A few kilometres past this turn-off the Vryheid road plunges into an enormous fertile valley containing both the White and Black Umfolozi Rivers. This valley was a favourite hunting spot of a succession of Zulu kings, and to mark its importance in Zulu history a monument has been erected on the side of the road just as it starts to drop. This gives visitors a wonderful view of the entire valley floor laid out beneath them, with a large diorama providing details of interesting features, such as the burial sites of the various kings. 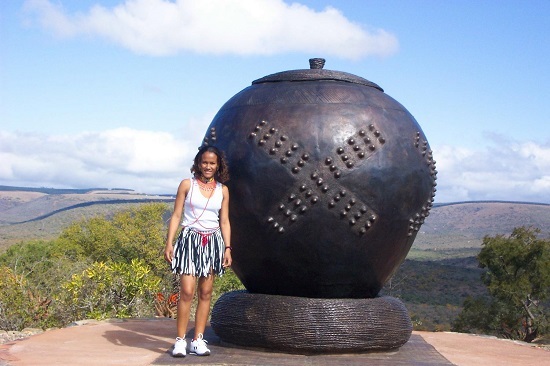 The monument is marked by a giant “khamba pot”, the traditional clay pots which Zulus use to drink “mqombothi”, their home-brewed beer.